On a sequential basis, operating profit fell by 14% to Rs691.4 crore. While the July-September period has traditionally been weak for ACC, the drop in performance is still worrisome. Material costs rose on a per-tonne basis. Gypsum, slag and fly-ash costs have increased. Diesel prices, too, rose, leading to higher power and fuel costs. Interestingly, ACC reported a marginal improvement in sales realizations, although cement prices started falling since August. Reason: Prices in Uttar Pradesh, the largest market for ACC, started dropping only from September. A higher impact of this will be felt in the coming quarters. 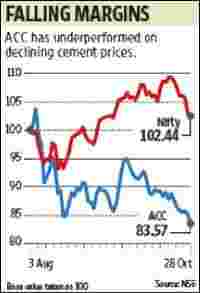 With cement prices going downhill in the near term, cement stocks such as ACC could be under pressure. “Cement prices are expected to weaken across cities in October-March 2009-10 because the industry will add another 30 mt new capacity," Centre for Monitoring Indian Economy said in its October review. Cement companies, however, argue that demand growth of 12-13% a year will help ease the industry’s woes. However, since capacity additions will happen in the next 12-14 months, the supply overhang will soften prices. ACC would be no exception to this trend of falling margins. Analysts had forecast an earnings per share of around Rs95 for 2009, but they anticipate a 20% fall in earnings in the year to March 2010.